After finally being able to sit down and relax in the comfort of my own home after a manic weekend, I hit an unsurprising realisation. I miss the halls of the London ExCel, bustling with stalls and tables, people swarming the vendors and displays. 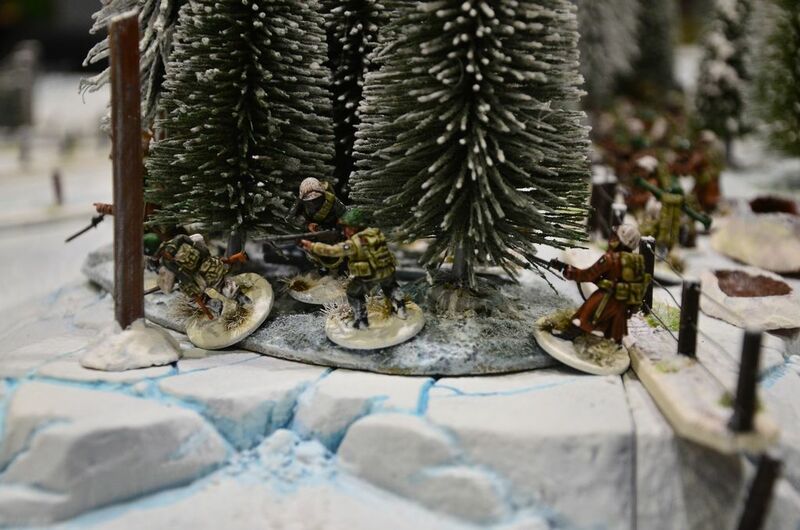 There’s certainly a wonderful feeling from attending Salute, a sense of joyous comradery from being within the vicinity of so many fellow wargamers. But moving on, let’s get into some of my highlights of the show. One of the pleasant surprises of the show for me was my stumbling upon a game called Collision coming from Code Orange Games. A fellow TTGUK staff member told me I’d like it and I took his word and popped over to have a gander. I was pleasantly surprised! Mattijs at the booth was very enthusiastic and excited to talk about the game and almost knocked me off my feet telling me that no dice were needed in the game. No dice! Not a single one to be seen! This instantly grabbed me and he then continued to explain that the game uses an interesting system of cards to determine chance of success for actions. I adored the models which consisted of burly, hellish mutants named the Unwanted and weapon-toting ladies of battle named the Nyx. The lighting at the show proved a little inconsistent, so couldn’t grab a great picture of the booth setup. But trust me, it looks pretty great! The setting and terrain on show was wonderful to peruse, suiting the post-apocalyptic setting nicely. 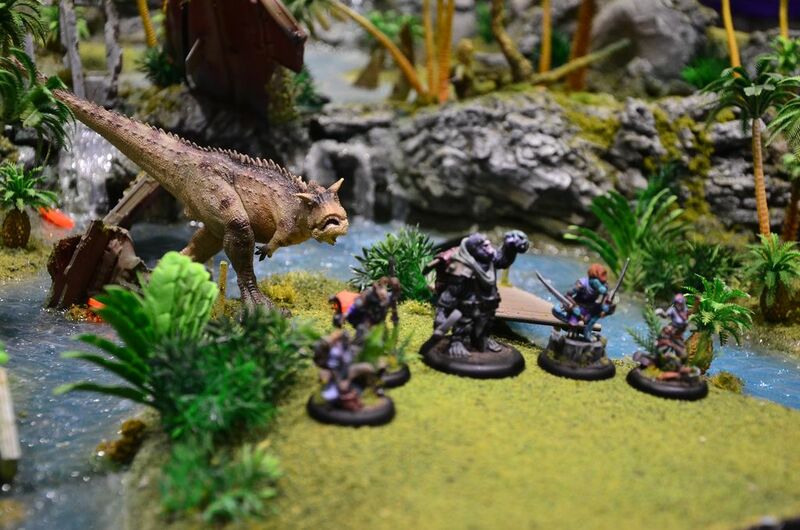 A lot of the terrain was 3D-printed, boasting a surprising level of quality which really added to the booth. The game system was intuitive whilst also accessible, it can even hold a major element of bluffing/poker-facing to help you attain victory. I’ll be reporting back more on Collision in the future, for sure. There’s also a big appeal in that plenty of assets needed for the game (counters, mats, etc) are available online to print. You can use these yourself if you don’t want to pay for produced items themselves, but I will say that the mats especially were very nice. I’d personally fork out a little extra for it but it’s great to see a more financially-accessible option there! 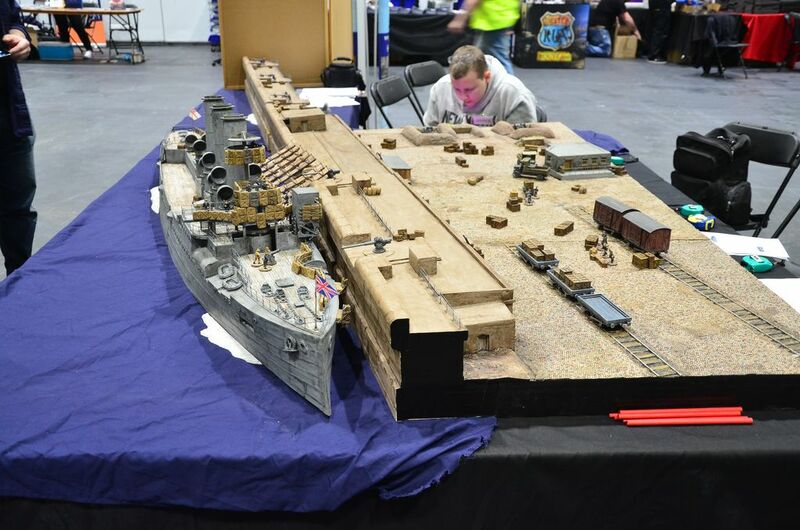 There were plenty of exclusive miniatures available at the show across numerous stalls and game systems. One particular model stood out that and that would be the Emissary of the Blazing Sun for Wild West Exodus of Warcradle Studios. 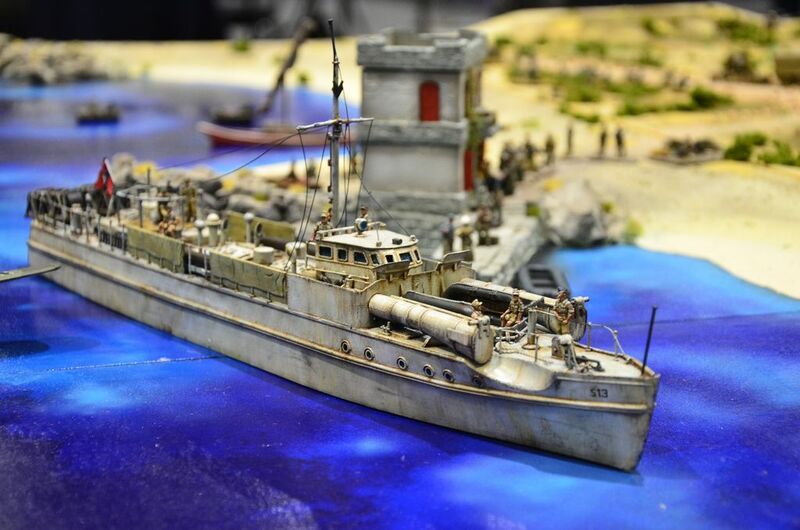 Shown on their website a few days before the show, there was an almost constant horde of people at their stand eyeing up the model on display. Warcradle were well-prepared and had a good number of staff-members on-hand to help out and showcase their items. It looked like a busy day for them so it certainly seems that WWX, as our previous coverage supports, is not going anywhere anytime soon. 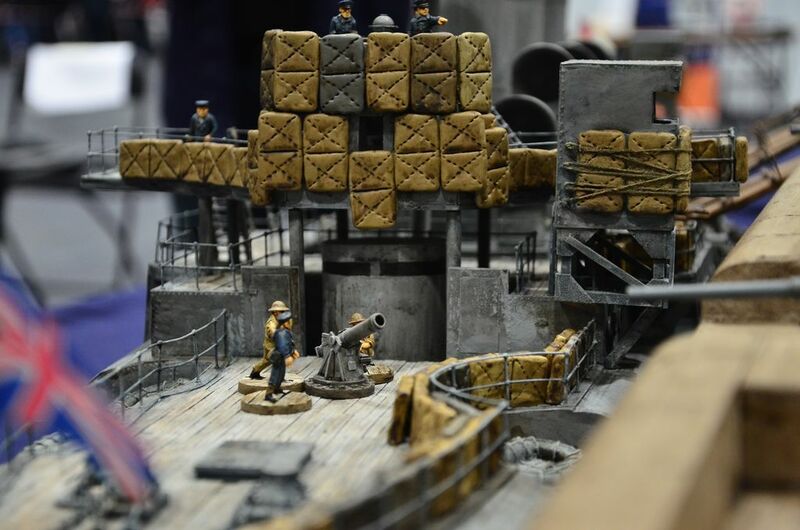 Destroyers are for pre release at Salute. Retail release potentially over the next few weeks, this is confirmed on the website. Dreadnoughts are coming next! Fairly soon, too. These are HUGE models! He teased us the scale against existing models and we can vouch for this claim. It took around 15 days CAD time to get them designed and ready. 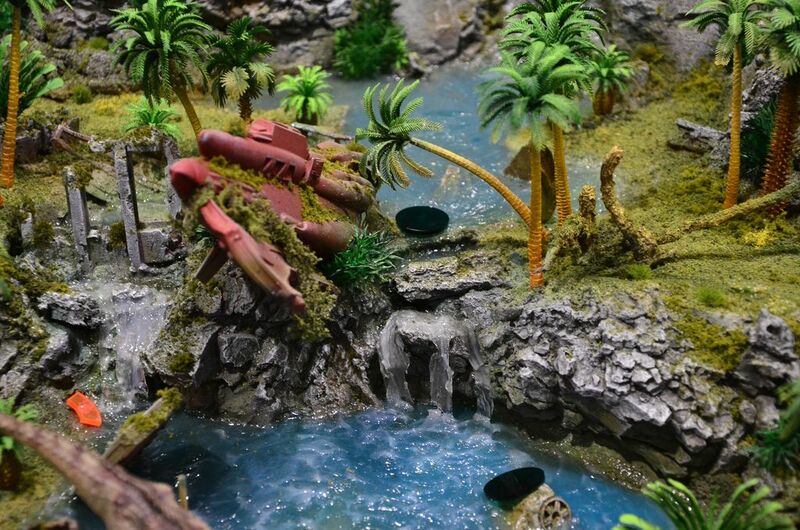 These are possibly the most involved and detailed space-ship miniatures on the scene to date. I’m dying to see the upcoming Dreadnoughts, but the new Destroyers are nothing to sniff at, either! Only a few tidbits, but some very exciting information for sure. After all, who doesn’t find gigantic and immensely powerful spaceships to be exciting and cool?! 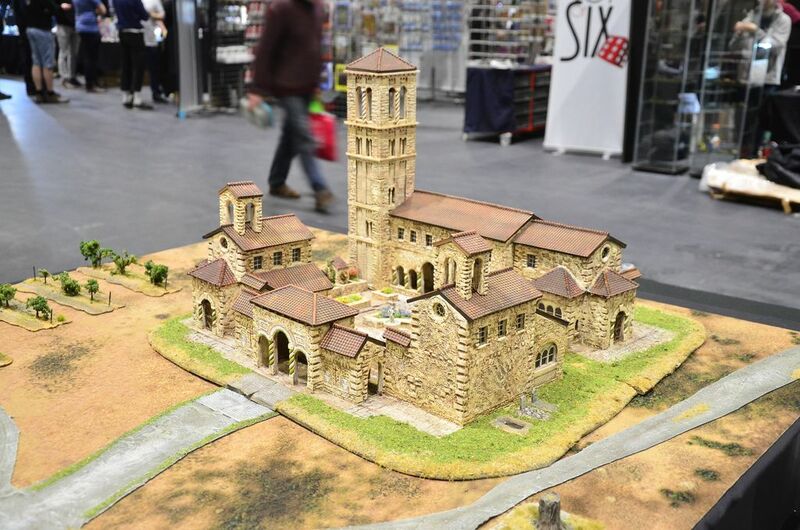 Modiphius Entertainment were at the show too, showing off a number of their products. 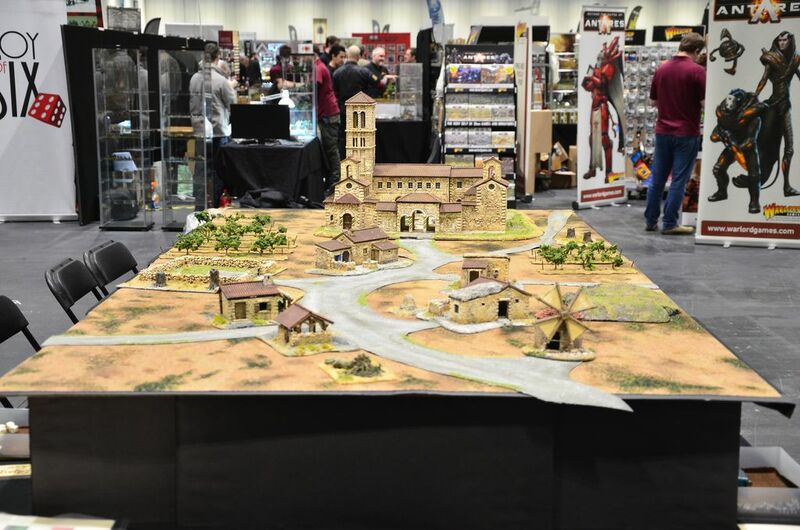 Excitingly for me, the Fallout: Wasteland Warfare game was also on show on demo tables! Sadly, I wasn’t able to give the game a go myself but it was delightful to behold. 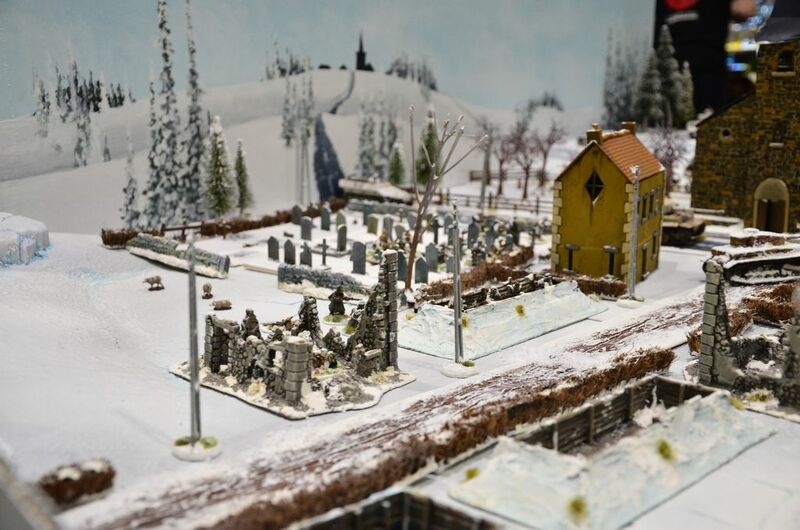 Seeing the miniatures on some lovely, appropriately themed tables really gave the game some visible life. 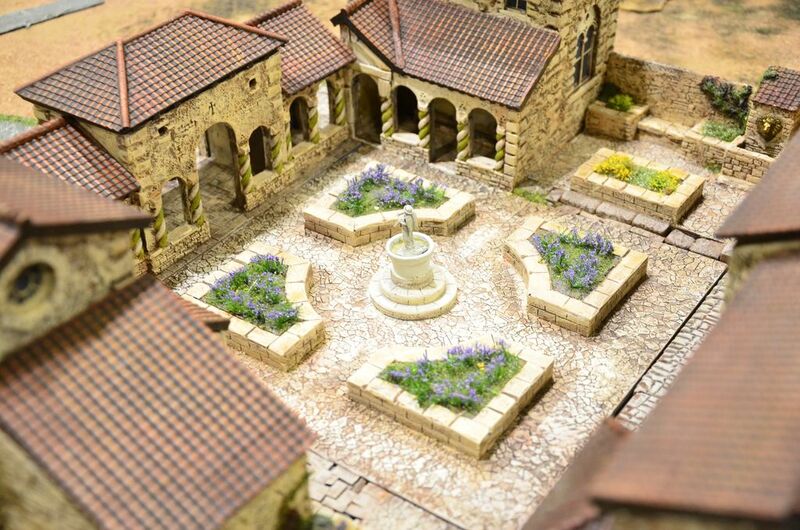 We’re looking to get our hands on this as soon as possible so keep checking back if you’d like to learn more! 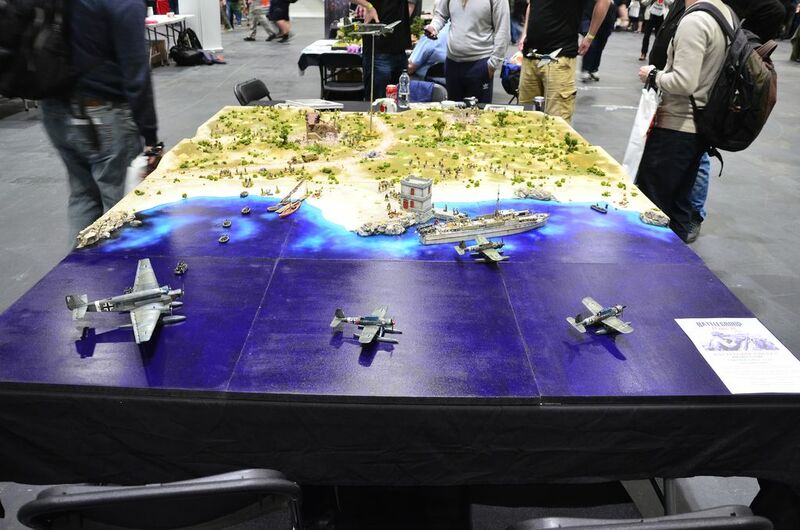 There were a great deal of table displays at the show, some purely for your eyes to peruse and some being used part-way in games. Every single one I laid my eyes on had been intricately made showing levels of detail and effort that almost floored me. 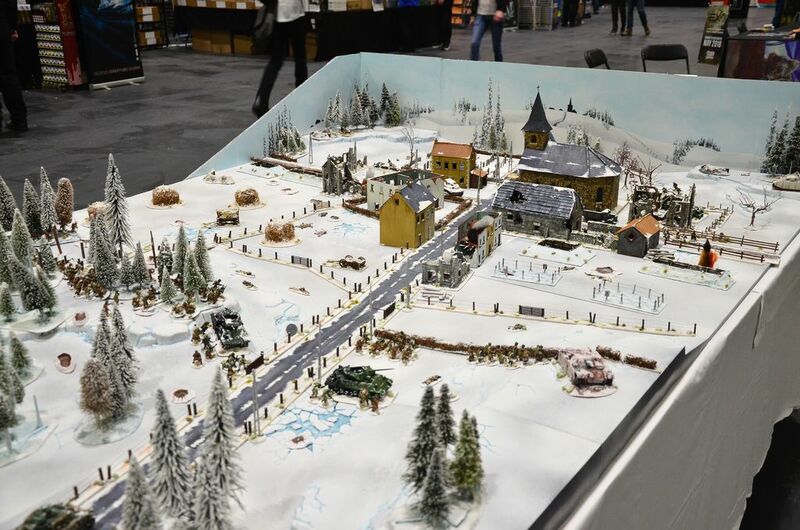 There were some real heavy-hitters, including a gigantic table being used for a huge Bolt Action game. Another shout-out goes to the large pirate display that was in the hall as soon as you entered. These ships may not have been built in bottles but their size and level of detail were astonishing to behold. I heartily commend everyone who participated and contributed to these large tables and projects! It helps make the show not just a mass-frenzy of buying and playing. It helps to show some of the skill and patience that goes into the hobby. Ok, so this is sort-of the opposite of a highlight but it’s worth a mention. 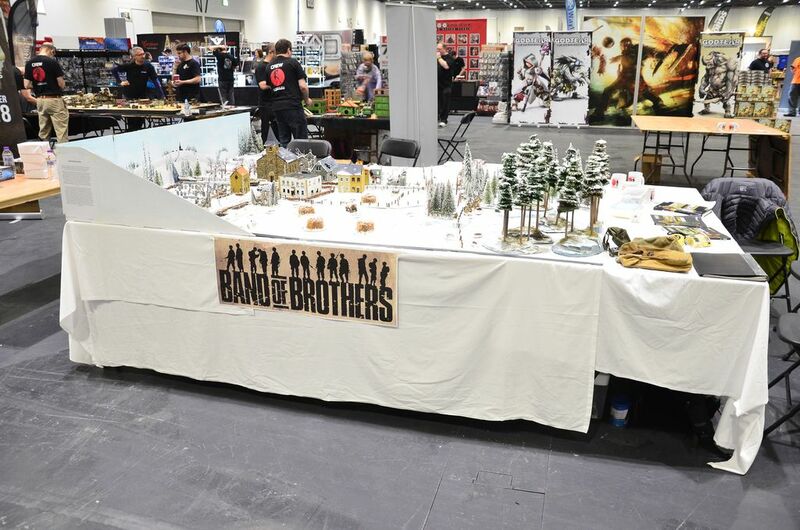 GuildBall-famed creators Steamforged Games had a very sizeable stand this year showing off a few demo tables of Godtear. if you haven’t seen, has absolutely smashed its kickstarter. I’ve looked into the game briefly and love the sound of its setting and premise. This was possibly one of the busiest stands at the show. Every time I popped by there was a queue at the till and people huddled around demo tables. It was so busy I, sadly, never got a chance to try out Godtear. I’m sure my time will come but I just hope it comes soon. Still, it sets your hopes pretty high when a game seems to be garnering THIS much attention. We managed to grab a bucket-load of images from the show for your viewing pleasure. Find them in the slideshow gallery below. 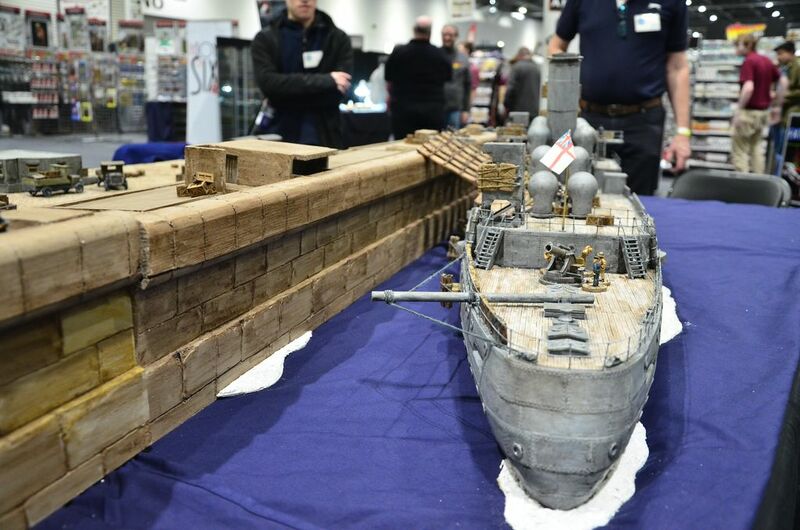 There was plenty of other goings-on at Salute, but there were the prime highlights for us. We’ll bring you any follow-ups or updates regarding the above games and information when you get ahold of any. As always, stick with us here at TTGUK for more updates and news on your favourite games. Our Facebook is regularly keeping folks updated so pop by and keep checking back!